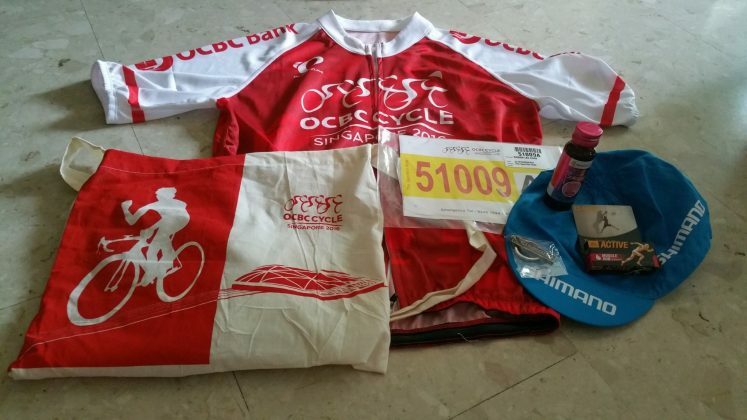 OCBC Cycle Review: Sportive Ride [42 km] (by KenJoe) | JustRunLah! As I began to write this I realized that it could be lengthy given my natural inclination. 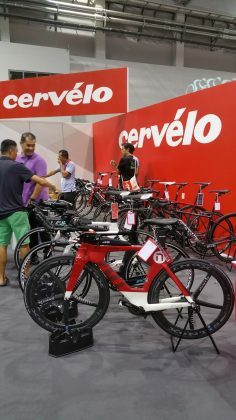 I decided to break it into two parts so here is part one first – as objective a review as I could from a layman’s point of view and someone who doesn’t cycle that much (or at all actually) till recently. 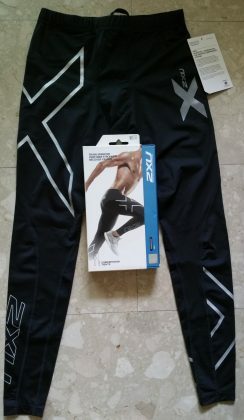 Part II – I will write it later when I get some free time and when folks are still interested in the musing of a late starter in running and now cycling. The OCBC Cycle mass event was into its second edition, organized by Pich Event Management and of course with OCBC as its Title Sponsor. 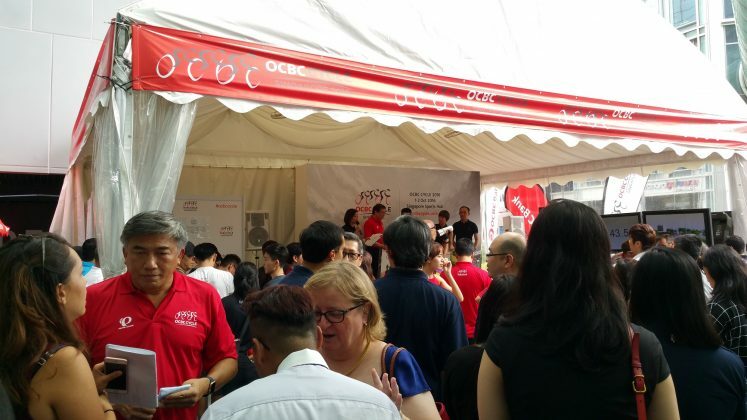 OCBC also supported 4 charities through this initiative. 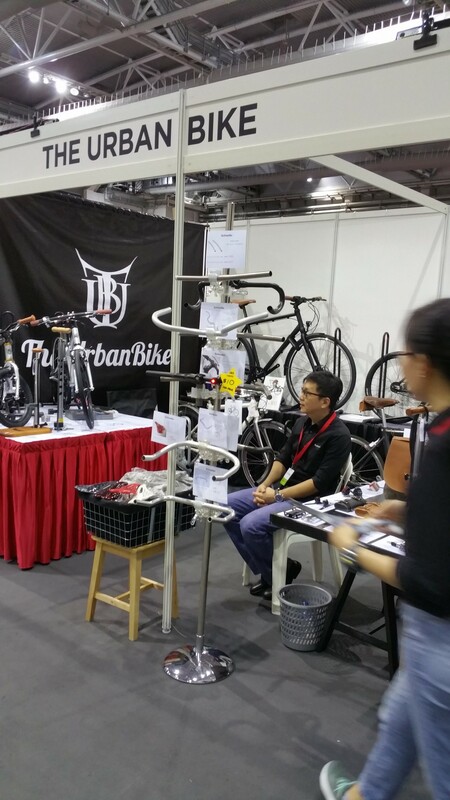 It was a 2-day event. 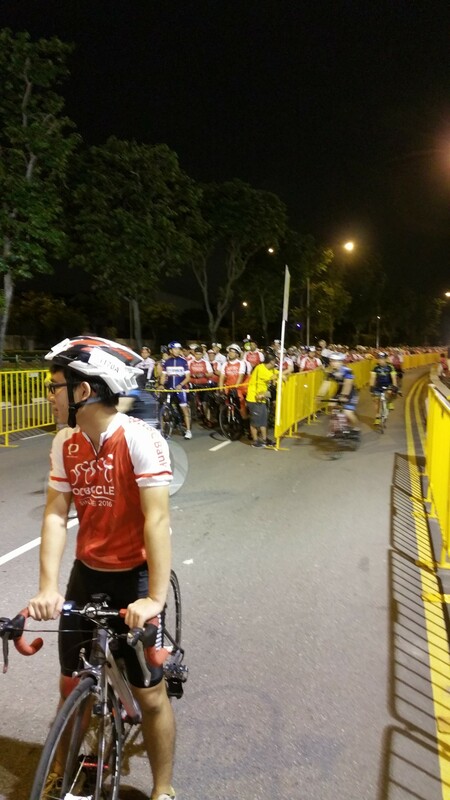 There was a competitive OCBC Cycle Speedway club championship held on first day. The Mighty Savers Kids and Family Rides were also held on Saturday. Second day event comprised of a 42 km Sportive Ride and a 23 km Straits Times ride which are non-competitive held last Sunday. 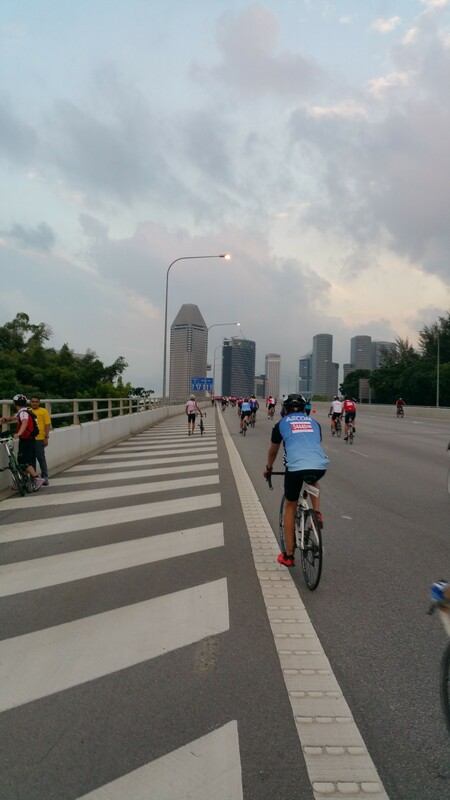 I signed up for the 42 km Sportive Ride – my second time too. The launch at Orchard Gateway on April 14th was very well organized in my opinion and made more exciting by the attractive prizes for early birds (first 300 would receive special gifts) in the queue. 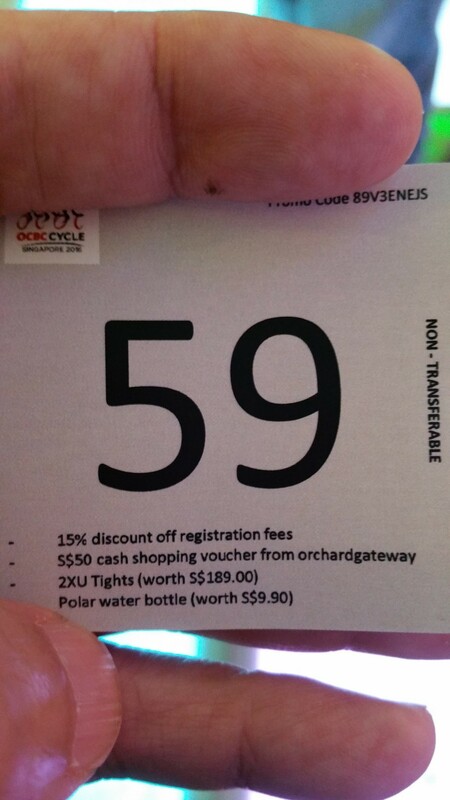 I went earlier to queue and was 59th in the queue ! 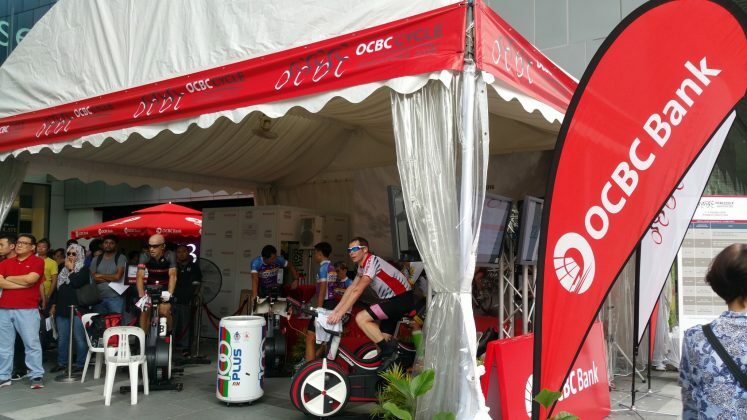 For the first time, to commemorate today’s launch event, four teams of riders formed by Friends of OCBC Cycle and invited guests cycled for 24 hours from 12.00pm on 15 April to 12.00pm on 16 April to achieve a record. Based on announcements, there were 13 pre-event workshops and activities for participants to sign up for, starting with a Singapore Sports Institute Learn to Cook Healthily workshop on 14th May, to the Volvo Route Familiarization Trip in September. 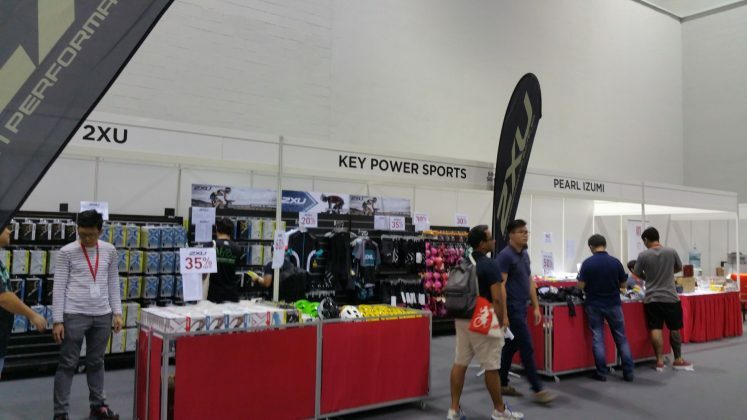 Collection of the event pack was done from Friday to Saturday just before the actual event at Sports Hub OCBC Arena in conjunction with the Expo @ OCBC Cycle. So you could browse and purchase cycling related equipment and accessories at discounted prices. I was able to collect my event pack within 10 minutes. 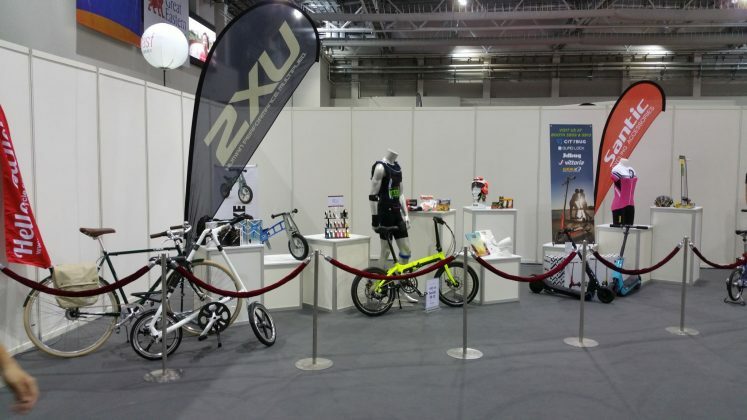 I also enjoyed browsing through the Expo exhibits. Kudos to the organizers. The actual event was held on Sunday morning 2nd October. 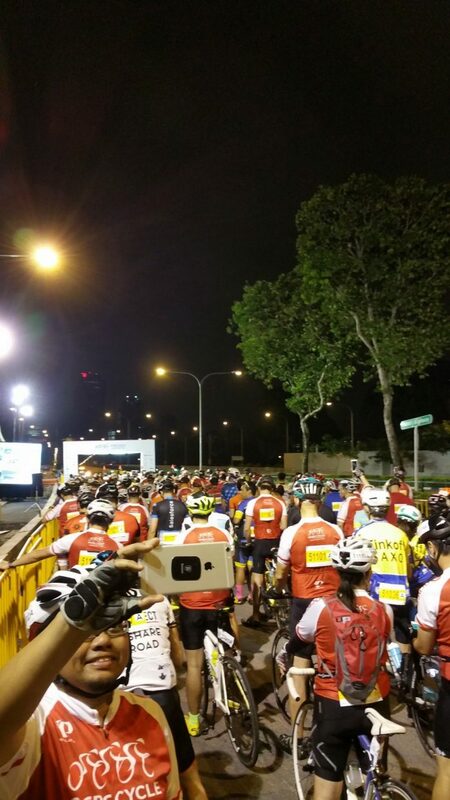 The race started at 5.15 am as planned. I was in wave A so I arrived at about 4 am. There was a crowd but everyone was orderly, patiently riding or walking with their bikes slowly to the starting point. I saw folks also streaming into the area for later waves so the majority of folks were complying with the instructions to report at least one hour earlier. The event was flagged off in smaller waves within wave A and I was in wave 3 of A but the intervals were rather short so everyone was all pumped up and excited to get riding off. Everyone was also reminded it was non-competitive and to enjoy the ride. Cheer Girls Out at Dawn ! 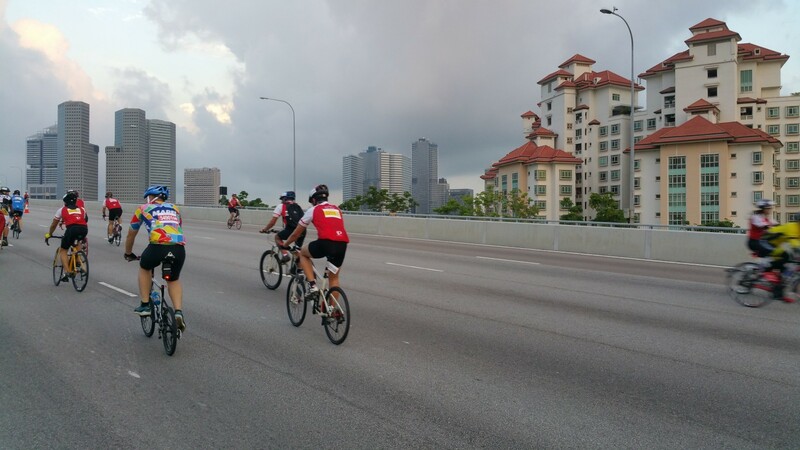 The route did have a few sharp turns and bends but volunteers were on hand to shout out to cyclists to pre-warn them. There were also two rather steep down slopes (ECP bridge downhill) which I found myself holding onto the drop bars (for dear life !? ), with my whole body tensed up, especially in my arms. I didn’t even have to move my legs and my bike was overtaking the cyclists in front down the slope each time. I was doing the reverse of sitting back in my seat and trying to slow down the bike with as big a surface area as I could present ! (It didn’t seem to work.) There was a couple of tough climbs, notably the Sheares Bridge climb. An earlier part of the route also took us through a tunnel. It felt warm being in the tunnel relative to the fresh cool air out in the open but it was only a short stretch. I loved the fresh morning air and the wind whizzing by on the roads. 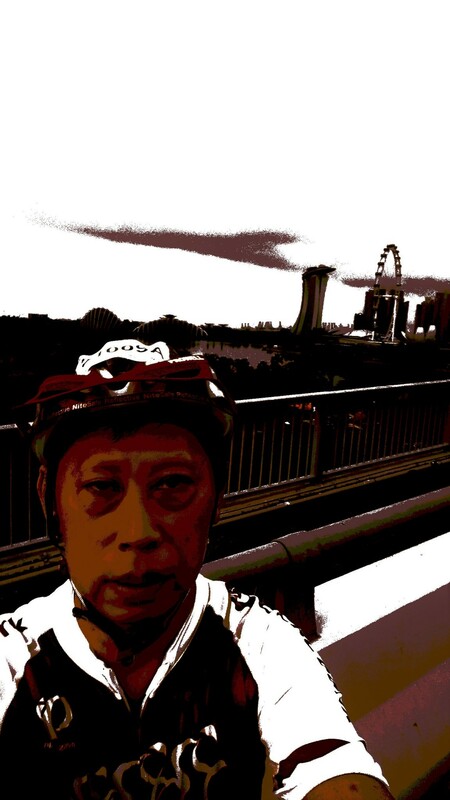 In this year’s ride, I wasn’t trying to ride fast. I was trying to ride safely. 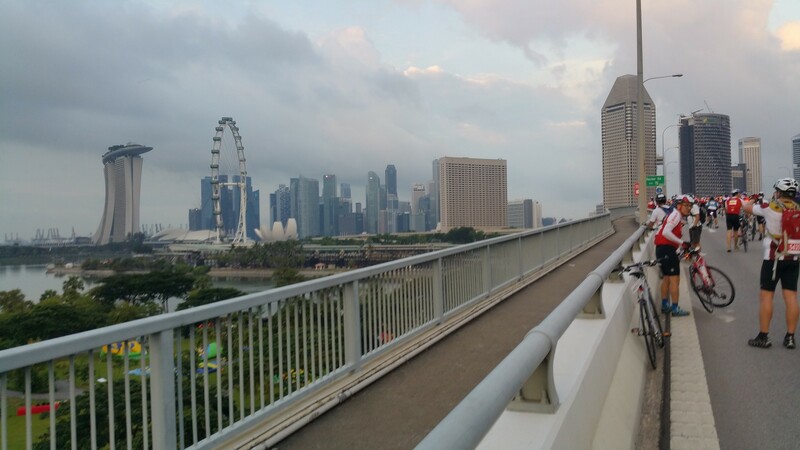 In fact, I did spot two participants, both relatively young, a male and a female who were riding without helmets on separate occasions both ahead of me. I wasn’t sure how they managed to get through the volunteers in the first place. There were adequate hydration points and medical posts though I didn’t count them. I stopped at one hydration point towards the end and was given a bottle of 100 plus which I downed in quick gulps as the morning was turning hot. I also took some photos at the designated selfie stops. The ride ended within the Sports Hub in cool air-con comfort which was welcoming for finishing riders. After collecting the finisher medal, a bottle of water and 100-plus, we were told to move on to vacate from the Sports Hub. I remembered this was what happened last year too. But I think this round, they were not as insistent or perhaps it was still early. 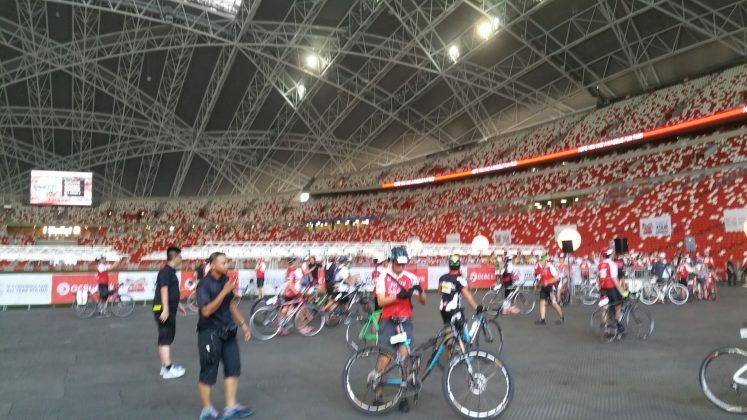 But generally, everyone was pretty good-natured, and moved on, after they snapped some photos of themselves, or their bikes in the stadium. The atmosphere was friendly and everyone wore a smile of accomplishment in completing his/her ride. I was happy that I completed taking off about 25 minutes from last year’s record (will write about the details in part two). Outside the hub, there was also a ‘stall’ that had a nice range of fruits from apples, pears to bananas that you could help yourself to. A nice friendly touch. So overall, I enjoyed this year’s event more than last year’s and I would give a thumbs up for this event. 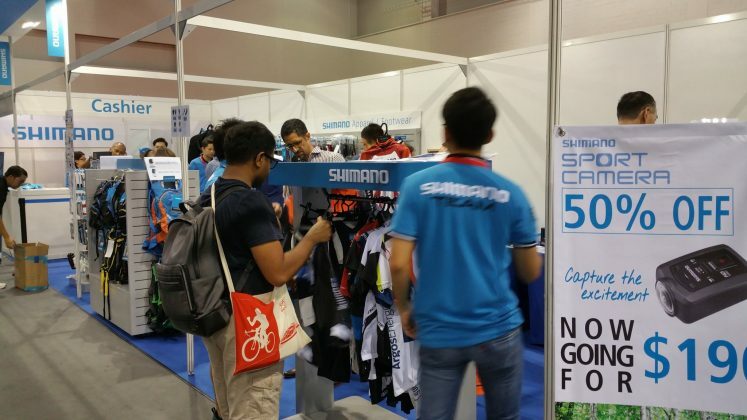 While it was a sportive ride, and not a race, many cyclists were riding as fast as they could somehow. 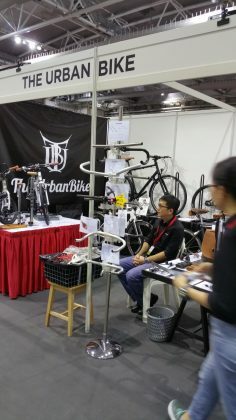 It will be advantageous to be able to ride fairly well if you want to be in the earlier waves. Otherwise you probably would find it easier to go in later waves, provided there is no congestion. Whatever it is, you need to remember to ride it for the fun and not for the speed in this mass event. 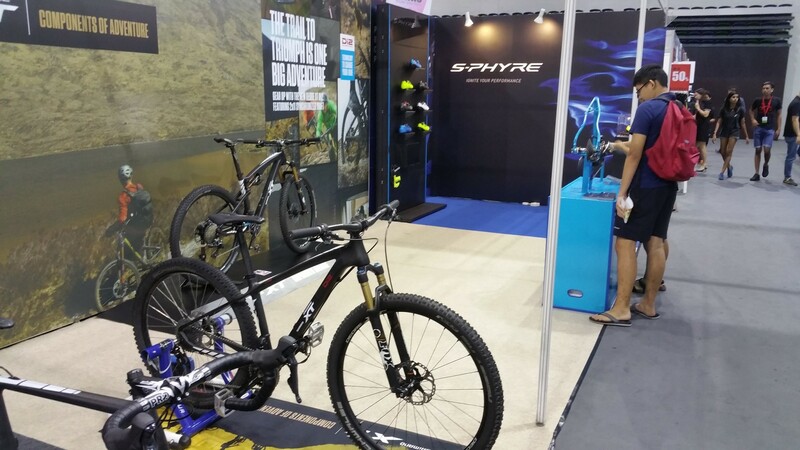 The sharp bends and steep slopes would require some good handling of the bikes if you want to enjoy the ride fully. As expected, there were some falls and incidents but I only saw some visiting the medical stations, not the incidents. 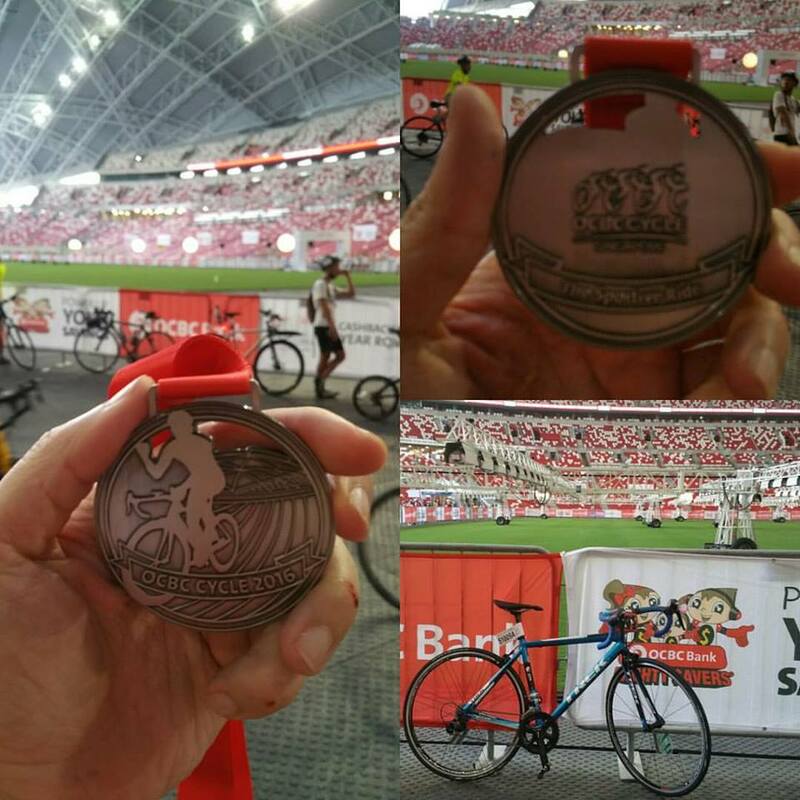 I did discover later from a number of FB posts that some cyclists who completed after certain timing were either given the wrong finisher medals or went without any as the medals ran out. I understand this was very disappointing for most as they had hoped to take photos too of their triumph with the medals. BUT I also saw how the organizers immediately responded and apologized and promised to look into the matter. They also promised to deliver the medals to the individuals. 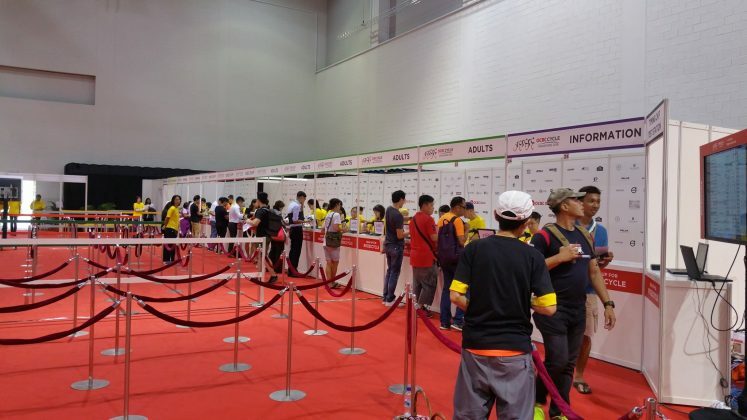 By the time of my writing, I also had received a message from the organizers to register if I have not received the medal so that they could deliver the medals. 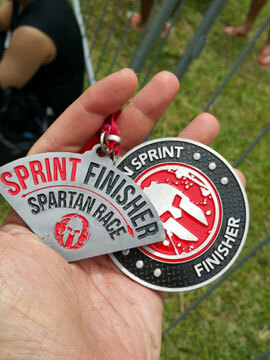 Apparently from the accounts some of the sportive medals may have mistakenly handed out to the kids participating on the first day. 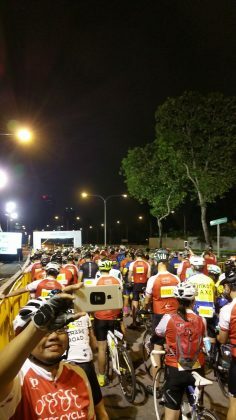 The amount of efforts to recover from this is tremendous as they would need to reach out to every cyclists – there were about 6400 participants this round. So there was some lapse in quality control over the management of the medals, but I would acknowledge their efforts to recover from this tough (and costly) mistake. 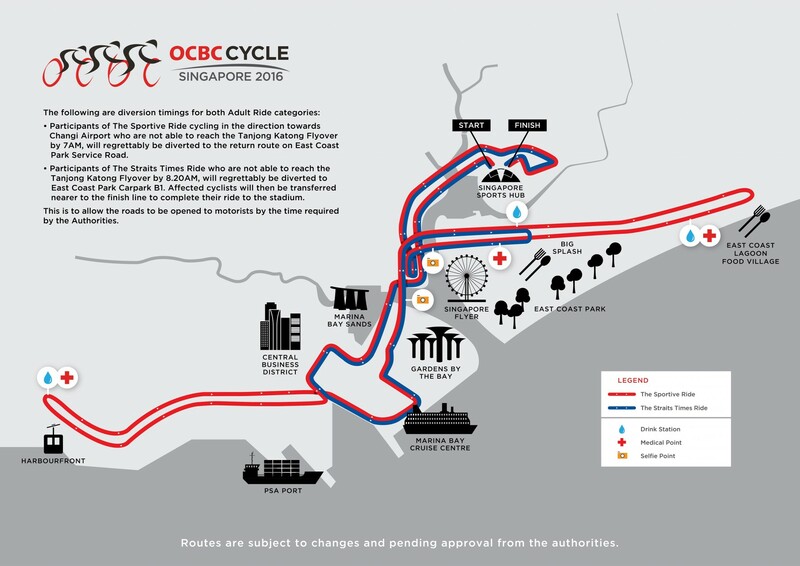 Hopefully everyone gets his/her medals soon and folks would still treasure the experience of riding on 42 km stretches of the scenic road without Singapore’s traffic that morning. Enjoyed the ride a lot more this round. Always great to add some variety to life as to running too. 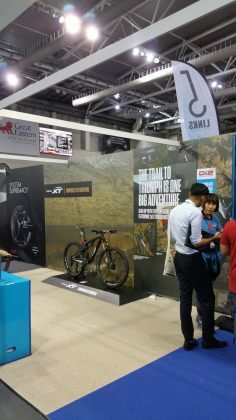 So ride and run safely, happily till the next race!